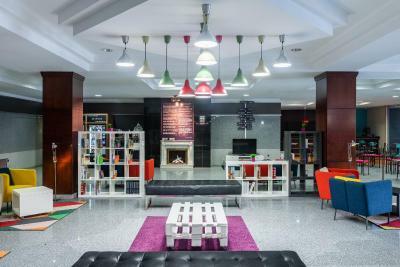 Lock in a great price for Tryp Jerez Hotel – rated 8.7 by recent guests! The location was great. Alonso at front desk was very helpful and kind person. Nice location. parking garage is available for a fee. very close walk to the Horse show. The street behind the hotel is tree covered and very inexpensive food and drink. We walked to the more touristy area one evening, which was much more crowded and expensive. 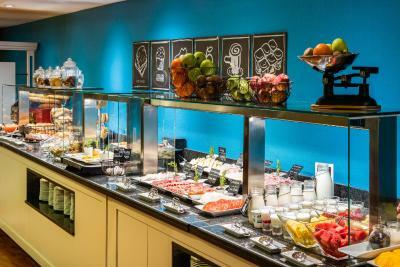 Breakfast buffet was excellent. Room was comfortable and quiet. 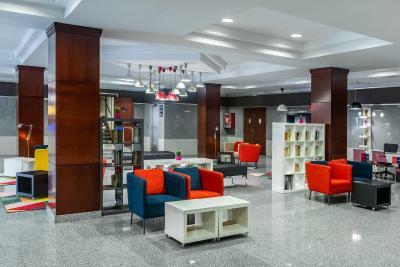 Great central location close to the Plaza Arenal. Easy walk to the many bars and restaurants in the area. Room spacious and very comfortable. Good bathroom. Staff lovely and helpful. On site parking a bonus. 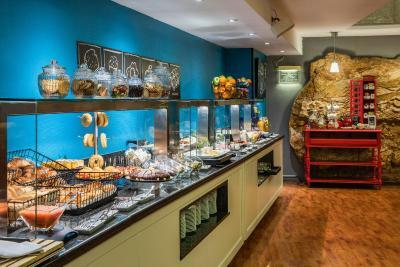 Good location, Breakfast very good with a wide selection. A wonderful location close to all the sights. Recommendations by Francis at reception were very helpful...especially the restaurants he suggested. 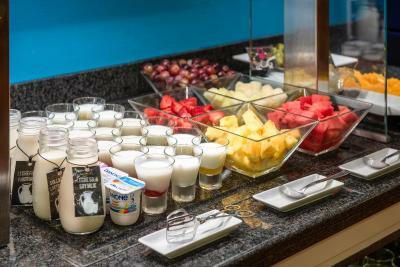 Was an excellent selection for breakfast. Would highly recommend this hotel. 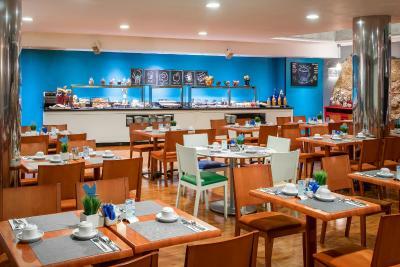 Very comfortable hotel close to the Plaza Arenal. Staff helpful and friendly. On-site parking a bonus. 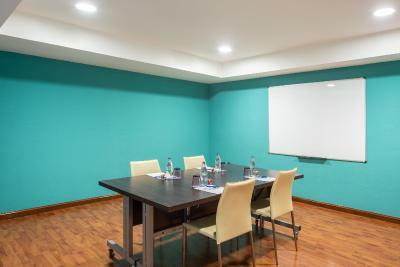 Tryp Jerez Hotel This rating is a reflection of how the property compares to the industry standard when it comes to price, facilities and services available. It's based on a self-evaluation by the property. Use this rating to help choose your stay! 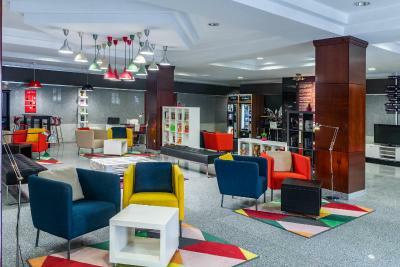 Tryp Jerez Hotel offers modern rooms in the center of Jerez de la Frontera, famous for its sherry. In an impressive classical building, it is surrounded by attractive gardens with orange and palm trees. 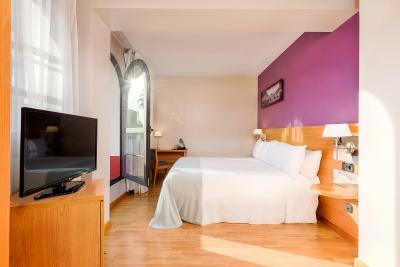 The rooms at Tryp Jerez Hotel feature air conditioning and satellite TV. The private bathroom include amenities and a hairdryer. Free Wi-Fi is available. 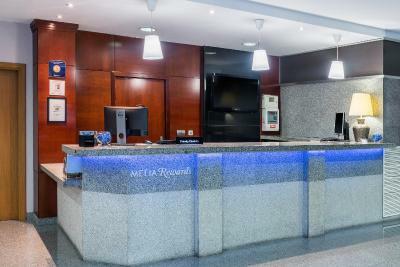 The staff at the 24-hour front desk can offer information on Jerez's attractions, including the Royal School of Horsemanship and the many nearby vineyards. 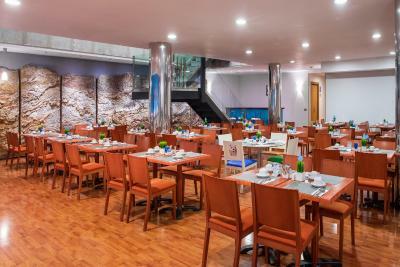 Reservations can also be made for flamenco shows. 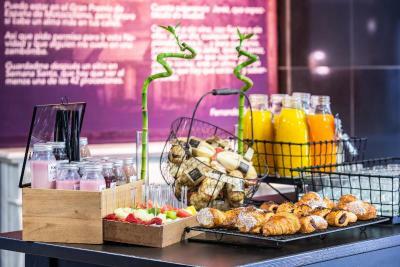 Guests can find bars, restaurants and shops within a 5-minute walk of the hotel. Puerto de Santa María and Valdelagrana Beach are just 9 miles from Tryp Jerez. 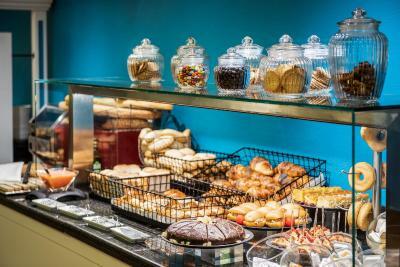 The hotel's buffet breakfast includes pastries, juices and hot dishes. There is also a café. 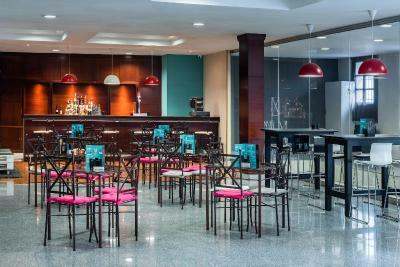 The elegant La Goyesca bar provides an ideal area to relax with a drink. 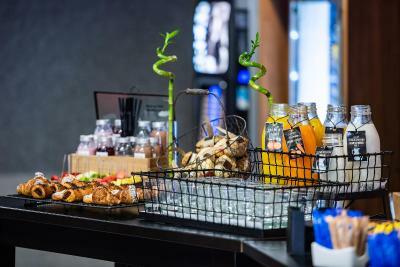 When would you like to stay at Tryp Jerez Hotel? 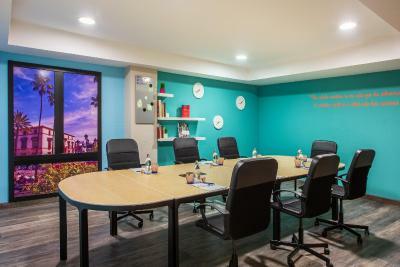 This air-conditioned room has free wired internet access and satellite TV. The private bathroom comes with amenities and a hairdryer. This premium room comes with a bathrobe and slippers, and a kettle. 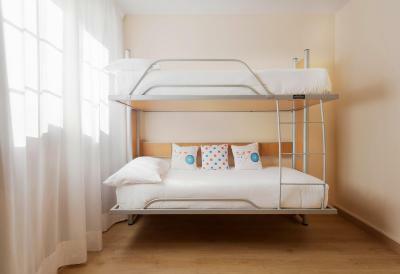 This room includes 2 bunk beds to accommodate the children. 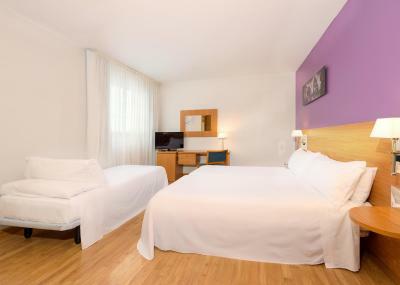 This twin room features a mini-bar, view and air conditioning. 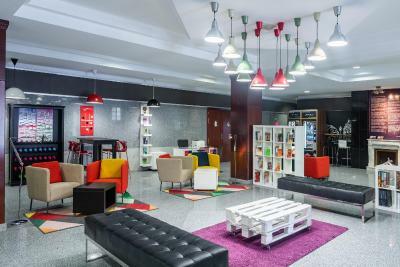 House Rules Tryp Jerez Hotel takes special requests – add in the next step! 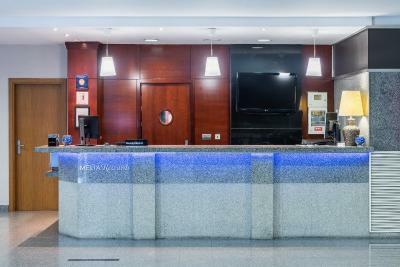 Tryp Jerez Hotel accepts these cards and reserves the right to temporarily hold an amount prior to arrival. Please note that the hotel requires passport details for guests staying during the World Motorcycling Championships. 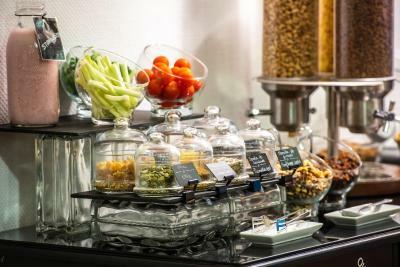 The hotel will contact guest directly for this information. Our room 219 in the back eas extremely noisy from extractor fans outside. The tv could only be viewed from the bed - chairs are optionsl extras. The location is outstanding, and the large front rooms are very comfortable. Had a bedroom overlooking the road at the front of the hotel,bit noisy at times. 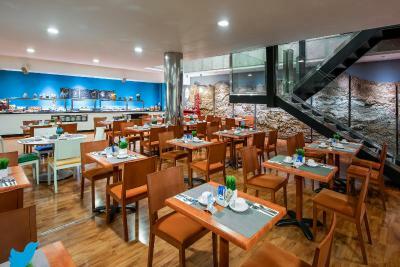 The hotel was clean and comfortable,the location was very good for shops,restaurants,and sightseeing. When we stayed the first night in the cheaper room, the mattress was a bit too firm for my liking; we upgraded the room on the second nigh to the one with the balcony with the flags above the hotel’s front door, it was fabulous. I am not keen in the dark mirrors in the showers. The staff. Happy to help, friendly and professional. I made the stupid mistake of booking the hotel through Booking.com for the wrong dates. I quickly tried to change it but Booking.com website wouldn’t let me. I contacted the hotel and they were super helpful and friendly and allowed me to change the date and only pay the difference if applicable. I did the same stupid mistake with the 5* Parador in Cadiz and they were not so gracious. So a huge thank you to the team at Tryp Jerez! The breakfast was superb. We stayed in the room with the flags... excellent everything. Great location. Excellent breakfast. Quiet. The inside and the decor are rather cold and impersonal and do not retain any of the character or elegance of the old palace. Bathroom is small and does not have any shelving space; the hot water is far too hot (Scalding) and not in line with the environmental care the hotel claims to follow. Extraction fan in bathroom either non existent or not working; very annoying anti theft coat hangers. Noise from corridor can be heard inside the room. Our room was giving into an inside courtyard very poorly kept with ledges breaking off. The property is well located only few hundred meters from the pedestrian and historic area. 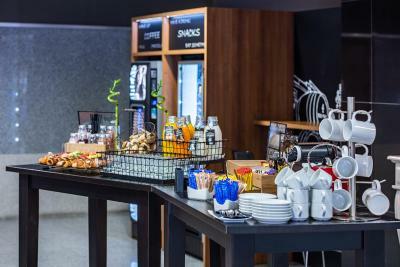 The buffet breakfast is well presented with plenty of choice; good coffee and hot chocolate. Nice exterior of the building with impressive main entrance door. There wasn't much to not like. I got a room looking onto an internal courtyard, so no view, but I wasn't in the room much to notice or care. There was a good choice of options for breakfast. There was a good coffee machine, which managed to catch out my friend which only added to my enjoyment. 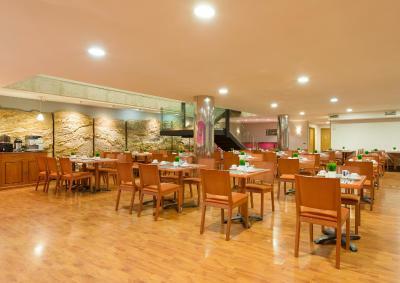 The hotel is close to the center of the town - only a few minutes walk to anywhere you might want to visit or any restaurants you might want to eat at. 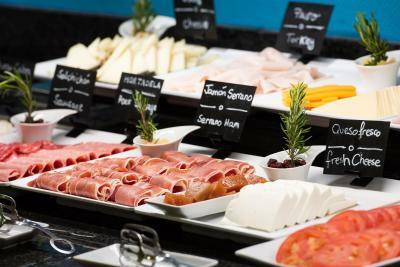 And there is a good choice of those, all with fantastic food. The onsite car park is a nice feature. Yes it is an extra but it is under the hotel and safe. The road to get there is literally round the houses, but they have a map at reception. Take it slow in the car park, it is steep up and down the floors. And when you leave, stop on the flat before the final slope to the garage door to use the intercom with reception to let you out. At the top of the ramp there is a sharp right turn, so position your car appropriately! Our towels were not refreshed daily, which was a bit disconcerting. Breakfast in the basement was excellent, and we enjoyed it very much. 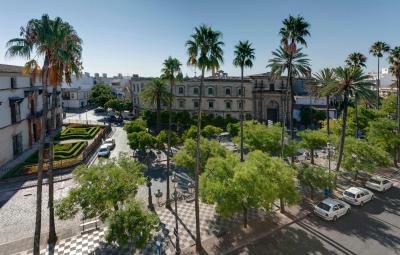 The hotel is located perfectly in Jerez, enabling guests to get around quickly. Staff members were friendly and helpful in making recommendations. Staff was great at helping with a booking problem. The ground floor was open plan and lacked a sense of direction. A more intimate and historical feel would have been more in keeping with this amazing building. The beautiful old building, its location and historic setting.